With two "angel wings" the Garden of Freedom is framing the 26 meters large Circle of Peace in its center, that is symbolizing the inner path. At the border of the garden to the European hiking trail No. 8 (the way through the world) there is a Border Stone with the inscription Yerushalayim on the "side of hope". On its other side suffering, both past and current, is addressed. Below it a slate stone in the ground with the inscription „Where dust is turned to light” is pointing in the direction of the Circle of Peace. The step at the entrance bears the inscription: “Recognize the Holy in your midst”. When rounding the circle, you arrive at the same spot again and again. You circle around yourself until you finally stop and walk into the inner to the Tree of Life. The German culture is full of light. It offers a host of marvelous cities. Its contributions to philosophy, poetry, and science require no further introduction. The prosperity of the current generation rests on a cultural foundation made possible by the great efforts and suffering of former generations. Without appreciation, without any desire to preserve the light of one’s own culture in times of flux, our country is destined to first lose its soul before it also loses its prosperity in the end. The understanding that change is essential to life, as well as the desire to preserve the light contained within culture, should be in healthy harmony. However, with the light of a culture also comes a shadow. This shadow should be recognized as such. There is great pressure in Germany to adjust opinions, bringing them in line with the perceptions of the majority. People who go against the dominant ideology of the “collective good” that currently prevails are often considered indecent or threatening, and subsequently marginalized. There is no broad public discussion about dissenting opinions. Without a corrective, the German nation is constantly becoming entangled in (self-destructive) ideas. Some time ago it was believed in Germany, that the world would become healed by the German nature; an idea of an unhealthy grandiosity. Today it is the zeitgeist, that people seek salvation in the dissolution of one’s own cultural identity. With that the cultural fundament supporting our society is eroding. Both measure and middle-ground have vanished. This is solely made possible by the intensity of the individual shame preventing any confrontation with the shadows skulking within. However, this would be the very human thing to do. Be a Mensch. The Rose of Shalom in the middle of the Circle of Peace stands as a heart symbol for the people reconnected to life. Here is a place that represents the beauty of life and the dignity of man. Here, man's inner yearning for holiness can become more conscious again: How can I experience a healing of the wounds of my soul in my life? How can I translate this yearning into a contribution to society? A “better world”, a healthier world, is only possible if ignorance, self-righteousness, and resentment dissolve, making space for a sincere dealing of each other. The inscription accompanying the Border Stone – “Where dust is turned to light” – represents this hopeful vision of living together, symbolizing the quest of free people for peace, reconciliation, and understanding; of themselves and others. Framed by the Garden of Freedom, the Circle of Peace with the Border Stone located alongside the walking trail represent this idea. It is committed to establishing a connection to the hearts of humans, where dust is turned to light. You can discover more about the spiritual background of this project – with several poems and interesting philosophical insights – in this elaboration about Nelly Sachs. A view of the Rhine Plain with Worms on the horizon. This city was once part of Jerusalem on the Rhine. Similar to a tree, which needs healthy roots for its branches to stretch out to the skies, a culture also needs its fundament, its roots. The roots of the modern German culture are yearning for healing; this project strives to provide a healing impulse. It elucidates that freedom can only originate from a consciousness of the own culture, that therefore can provide the necessary assurance and protection for the spirit in man to explore the heavens. Recognizing the roots of one’s own culture is vital, in particular its root "Jerusalem" and the way to heal this relationship. It casts a light on the deepest trauma of the German nation, the murder of the Jews and the accompanying destruction of Germany’s own cultural and spiritual foundation. Thus it is about a healing process of the German-Jewish relationship, the realization of a new Shalom, at that place where it is required most, in the most fundmental sense. It offers the chance to learn a real lesson from German and Jewish history: That humans are willing to bravely stand up for freedom – also, or especially, for the freedom of others. Rabbi Mordechai Mendelson places the Turning Point with the inscription Chai (life) in the Rose of Shalom. Underneath the Turning Point for Life is Psalm 1 in Hebrew, enclosed in a steel capsule. The entire monument was constructed in relation to this symbolic and geometric middle as a measurement point. There is a third way. Stubbornly clinging to the past does not offer any guarantee that the past will not repeat itself. Also the opposite position, making a clean break with the past, represents self deception. The Turning Point represents this third way. Already shortly after the Shoah, Nelly Sachs wrote in a poem: “You who raised no hand in murder, but who did not shake off the dust from your yearning, you who halted there, where dust is turned to light.” Here, we find the Turning Point for life and for Germany. This project paves a way towards the integration of Germany’s recent history. An integration that prevents a German "inherited guilt” from causing further evil. Unfortunately, the current political situation in Germany only serves to illustrate that this vicious circle is very real. The Garden of Freedom is about leaving the vicious circle. It requires self-awareness, an awareness that leads to real inner change. Above all, it requires the willingness of individuals to recognize and follow this way out. A culture of remembrance without any hope for peace, without aiming to a new life, without a Turning Point is more of an expression of a problem than a solution. A deep breath is required, instead of more pressure and finger-pointing. This deep breath allows for the discovery of one’s own being, which shows the way out of the pressure to adapt to norms that stand between people and their true selves, norms that force people into submission and demand perfection of them, following societal standards of what this very perfection would entail. Humans are moulded into shadowless beings who together form the perfect nation. But what great beauty there is in bringing people closer to the human perception of life in all its colours – as is shown by the rainbow. Individuals have the power to both change themselves and, through this change, their own destinies. It is impossible to effect change in others, let alone entire nations, from the outside; this change needs to come from the inside. The dark chapters of German past have causes that are also in the character of the Germans. By failing to recognize these weaknesses, the negative elements of the past are allowed to repeat themselves – in another shape and form. Self-awareness pertains to liberating oneself from the prison of one’s own glory about oneself, to break free of deceptions. This is a turn towards life, which revolves around liberation, not the conveyance of feelings of guilt. The self-awareness that can be found in the Garden of Freedom is a prerequisite for a Germany that can weather the challenges posed throughout time. To “Recognize the Holy in your midst” also means: Look inward and stop searching for the holy in external projections, even if they present a well-functioning distraction that leads away from finding yourself. The image shows the Threshold of Humility, which forms the entry to the Circle of Peace. This threshold must be overcome to start on the way towards the self. It's about the perception and the liberation from deceptions (through ideologies) and suffering inside of us; this is where peace and freedom begin. This means, that humans confront their own ideological and emotional entanglements, which are obstacles on the inner way towards themselves. But humans often also turn religion itself into ideology; however, religion is a way, halting on the way means not using it for going forward. Etymologically in German, the word “freedom” is related to love. People gave loved ones protection and the right to independence. At this time in the Germanic tribes belonging to The Free also meant to serve as an act of love, instead of coercion. It’s interesting to note that the original meaning of the word did not contain a contradiction to demarcated spaces for protection and conservation; these were associated with freedom. Here, you will find a short linguistic treatise on the German word “Freiheit”, meaning freedom. What are the conditions for a free and self-determined life? What constitutes our mental and emotional imprisonment? Eleven large stones in the "dark ring" of the Circle of Peace symbolize the blockades and entanglements that stand on man's way to himself between him and his freedom. Unfree people are identified with their entanglements and this is exactly the reason, why the world can be in a state as it is today. The liberation from the entanglements is symbolized by the Tree of Life, the central element in the Circle of Peace. (The Tree of Life has roots in the earth and branches in the skies. Thus, it connects heaven and earth, spirit and matter. That stands for the spiritualized person in whose essence a liberation works towards life). Society itself is similarly bound by its own entanglements, which need to be confronted. It is not possible to change others; however, each person can turn into an encouragement, by touching hearts through his/her own being and helping others make the turn towards life. The Garden of Freedom is located by the hiking trail surrounded by nature. It offers peace and inspiration for visitors to take with them and use in their daily lives. In the face of a painful experience of man in the world, the central element of the place of peace reveals the Tree of Life as a path to inner peace. Visitors can also find here a positive example of a future-oriented culture of remembrance. By courageously facing the past, we can help shape a future full of dignity and freedom. The Garden of Freedom is a site of contemplation. It offers beauty that profoundly moves visitors. It helps us find the way towards healing. So much evil in the world is confronted by so much effort. It would be a much better place if the good ideas and solutions – already present around us – were also perceived as such. However, the good that often adopts an unassuming or quiet identity is easily overlooked, ignored, or taken for granted. Bombastic expression, grandiosity is demanded, not simple beauty. The great noise of our times also deafens our inner ear, which tries to listen to the soft voice of our heart explaining what’s truly important. A Garden of Freedom actually has a big name. What type of greatness is implied? It has a simple language of forms; the special is in the details. Only those who look will see it. By observing and listening, allowing peace and quiet to take over, a new understanding of freedom can take root – a great source of hope in these times. We give thanks to each other (Pastor Mohr and I). There you see, what Yerushalayim could mean. If only one of us were to thank the other, one of us would appear great and the other small - and yet "Jerusalem" only works in cooperation. We are the discreetly dressed small figures, recognizable on the right-hand side of the image; however, the large figures behind us keep very still and they do not look any bigger, brighter and more important in the scene. However, they give the space a boundary and protect the event with their beauty. The result is a sheltered space in which Yerushalayim, the vision of peace, may be. “Yerushalayim – a call full of love for freedom for man. That we succeed in overcoming the (inner) fences in our dealings with one another and do not seek to find our inner stability behind fences of ideology.” - is the whole inscription on the Border Stone. It is a cry that echoes our longing for freedom and peace as well as human interaction defined by mutual respect. Especially it doesn't mean being stuck in an ideology of boundlessness, where those protected spaces that offer freedom dissolve. Boundaries are perceived and respected. So we can get closer together in a sense of security and good dealings. We overcome fences without tearing them down. Fascism and wars – which cost many million lives – are part of the German history. The experience has turned into a component of the collective German identity. Instead of looking away, it is much more valuable to look on it with a love that helps us heal the deep wounds in our relationships and our self-esteem. Only then will this past stop repeating itself in different forms. Self-hatred – which is still a form of hatred – is no answer to this dark past. Neither is a collective sense of guilt. But Responsibility to freedom can be a viable response for German society today. The Border Stone at the entry of the Garden of Freedom bears the following inscription “…that we do not seek to find our inner stability behind fences of ideology." Germany has had traumatic experiences with ideological imprisonment in its recent history. Freedom above all means to be able to think freely, to dare question each and every ideology. This requires the bravery to think differently, the bravery to freely express and exchange opinions. Evil alone does not sufficiently explain Germany’s dark past and the Third Reich. Any guest who traverses the country will be delighted by the many friendly, helpful, and kind-hearted people and will have a hard time imagining the workings of this past. The reasons behind this historical cathastrophy lies deeper: Why did so many good people in our country allow themselves to be lied to and misled? Why did so few speak up when they recognized the injustices, when it was still possible to speak up? Therefore, today’s culture of remembrance should – besides remembering – also concern itself with other matters than conveying feelings of shame and guilt. Focus should be placed on answering this question. The name Garden of Freedom carries with it a mission. Germany requires a culture of freedom and an upbringing towards freedom. This starts with the individual self-responsible and mature person. Fascism had free rein because there is so much lack of this culture – even today, Germans speak of “Father State”. There are not many today who dared argue against it, which is politically correct, but in their opinion very wrong. Even today fascism would still have an easy game. Why was this causality seemingly forgotten as Germany came to terms with its own past? Internal growth of its people is reflected in external processes in society. The Garden of Freedom represents a responsible and peaceful way of coping with Germany’s loaded past, by transforming it: A responsible and free civil society in which the right to freedom of expression is recognized as essential, meant, that Germany learned its political lesson from the past. The upbringing towards freedom offers us the tools to free ourselves from our upbringing (kokhavim). The monument for peace and freedom is located by the European long-distance hiking trail No. 8. Its situation strives to illustrate the interconnectedness of the European people as well as that there is a way to walk for peace and freedom. The "Peace Project Europe" is the result of an understanding of the teachings of the past. The experiences of war, genocide and the entrapment of the German people in the fascist ideology united the peoples of Europe to strive for a vision of peace and freedom for their continent. What influence can especially German politics exert to do justice to its responsibilities towards European peace and freedom? Is the danger of an ideology of borderless unity imposed from above recognized as such, as it will split nations and peoples as a reaction to it? To offer a suggestion for a healthy approach: What foundation of values is common to the Christian European nations that can be built on, so that a peace project of European peoples can succeed in the long term? In Christian Europe, ideas from Jerusalem have become a cultural foundation through the teachings of Jesus, a Jew. Jesus did not dissolve the Jewish Torah, he confirmed and announced it (Matthew 5:17). The tendencies towards collectivism, envy, and a spirit of subservience proved to be fertile soil for German antisemitism during the first half of the 20th century (see reviews). It’s vital to be vigilant against all collective manias and totalitarian developments. Human dignity is defined by the capacity to live in freedom and to walk through life in an upright and responsible way. If nobody stands up for these values of freedom, its spirit will wane. The Garden of Freedom is the result of a private initiative. It strives to encourage people to apply themselves to the cause of peace and freedom on their own initiative. This encouragement is required because the way towards one’s own maturity and capacity to bear responsibility is a difficult one. A “White Rose” is situated at the center of the Circle of Peace. The Scholl Siblings showed us – with their courage drawn from a deep faith – what it means to assume responsibility. This is also, or particularly, valid today. Then peace, then Shalom is possible.. There are many admonishing monuments in Germany, which point to a dark past. 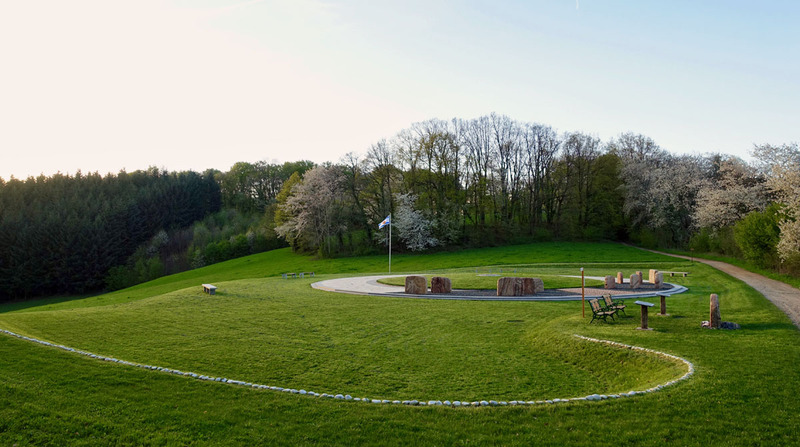 This monument to peace and freedom in the Geopark Bergstraße-Odenwald is a next step in peace towards a healing. The Garden of Freedom has been constructed by the side of a hiking trail in nature, because life itself can be considered a hike, and for peace and freedom, you have to get on the inner path. They are not found in the noise and importance of the world, but in inner peace and in one's own spiritual clarity. This resonates in the world. Similar to individuals, societies are in a constant state of flux. The Garden of Freedom is a remembrance, as well as an encouragement and sign of change for the good, towards freedom and light, towards life. Important steps in understanding are often realized in silence. A monument of some significance doesn’t always need to be situated in Berlin, the political capital. Here, by the European hiking trail, visitors can find the rest necessary to search out their inner peace – far away from the distraction of consumerism and the noise of a capital. The Garden of Freedom is located in the Geopark Bergstraße-Odenwald, by the side of the trail. The commemorative stones and natural stone slabs in the Circle of Peace are made from Odenwald quartz. This comes from the Borstein mine in Reichenbach, just 2.4 km away. There are only two quarries left where this natural stone, which is characteristic of the Odenwald, is mined.